I ignored the paper towel but smiled at her as I began to sort through the stalks, like saying, “I am just a friendly shopper, not wanting to be bothered.” She then changed her tactic and began coaching me in selecting my kale. “Nah, that’s not a good one. Too yellow,” she said, eyeing my initial choice. “Go to the back. Yeah, that’s a good one.” It made me nervous, like when someone stands behind you when you type and all of a sudden you forget how to type. To appease my new grocery shopping coach, once I found my kale, I kind of shook it to get some of the water off. “Don’t pay for water,” she said again. I gave her a half-laugh. Like, Oh, those darn Kroger people! Trying to get us to pay for water! to show her that I was somewhat on her side. “Have a good day,” I told her, walking off, to show her that though I was somewhat on her side I didn’t want to linger and chat about it. “Uh, okay,” I said, making my way to the mushrooms. So, I don’t plan on walking through Kroger and bossing people around, but I do have a grocery store tip for you. 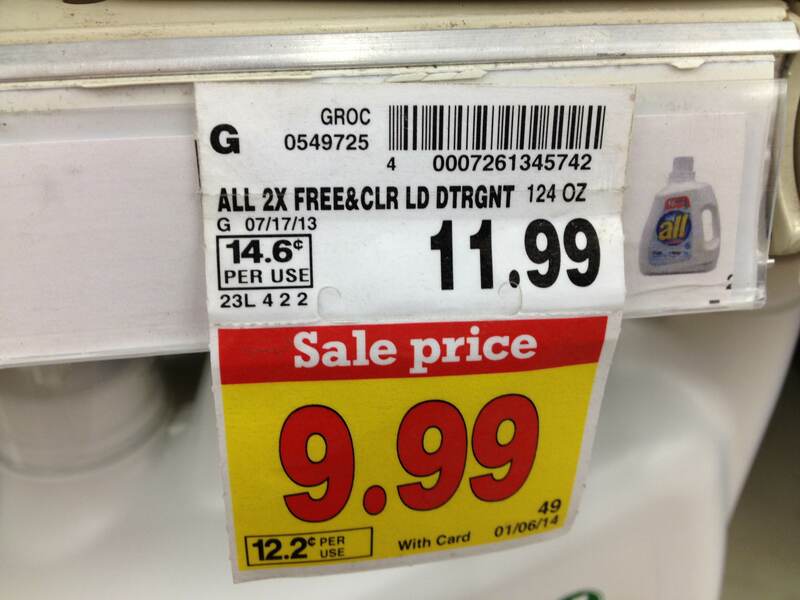 Whenever something I’m about to buy is on sale, especially if it’s a big sale, I take a picture of the sale price. That way, if it doesn’t ring up as on sale at the register, I can whip out my phone and politely hold it up for the cashier to see. It happened last week, and the cashier told me what a good idea it was that I’d taken a picture. So now I’m all conceited about it. Like, Oh, you don’t know the Kroger Picture Trick? Not robbing this girl, Mr. Kroger. Apparently rambling about the goings on of grocery stores is a trait I have inherited. I talked to my dad this weekend. We talk every few months so that he can ask how my husband is doing (seriously, that’s always his first question – Me: “Hey Dad, how are you?” Dad: “Oh, I’m okay. How’s Benson?”). Yesterday he had just gotten back from Sam’s Club when I called, so after he inquired about Benson’s faring, he told me the name and quantity of everything he’d purchased at Sam’s, and then tried to convince me of the benefits of Paul Newman’s salad dressing. I saw my dad a year ago. Benson and I flew out to Florida to visit him so that he could ask Benson how he’s doing in person, and he tried to send us home, on a plane, with a Sam’s size bottle of the Paul Newman dressing. I didn’t take it, thinking it had a good shot at giving me cancer due to the length of the ingredient list (I have a thing with thinking everything is going to give me cancer). Finally, do y’all think it’s weird that Kroger sells scarves? Every time I go in there it’s more and more like the mercados in Guatemala where you can buy a combo pack of hot sauce and peanut butter on the same aisle as electric heaters. Anyway, I bought a scarf. I kind of looked around, thinking, I’m doing this. I’m a person who buys clothes at Kroger as I tried it on, trying to act all casual. You forgot to mention the slap fight/shoving match we witnessed at the Kroger gas station! Most important Kroger question for me…. what do you think of the live music?? So much to discuss here. Yes, I bought you a scarf too! The live music is neat but I feel bad for the guy. Like, “oh, you landed to kroger gig, huh?” And I feel like I shouldn’t look at them. Like if I look at them I have to drop a dollar in their hat. Any live asda music in London? Denise, do you know how happy that makes me?! Spewing anything out your nose is my biggest goal here. “Just don’t pronounce it Kro-o-gersss, Kro-o-gersss, Kro-o-gersss!